Normally when I go to an urbex location it has been abandoned for quite some time. This definitely was not the case this time around. This hotel was foreclosed upon sometime in early 2010. From the looks of it, the employer ran out of time to remove their property. The pool was still half full of water. Networking equipment sat behind the front desk. The bar still had beer, juice, and other foodstuffs behind it. Despite being right next to a major highway the hotel is not easy to get to from the nearest exit. The nightly logbook indicates that even on weekends the hotel only had 3-4 check-ins. Employees recorded their malaise dealing with sheer boredom. If the United States economic woes continue unabated I have no doubt that this will not be my last urbex adventure in a foreclosed property. 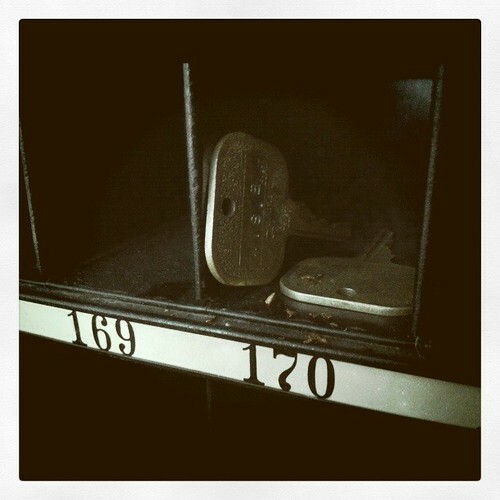 Photo: Keys to the conference rooms. Photo: The view from the lobby. Photo taken by Nick Forslund. 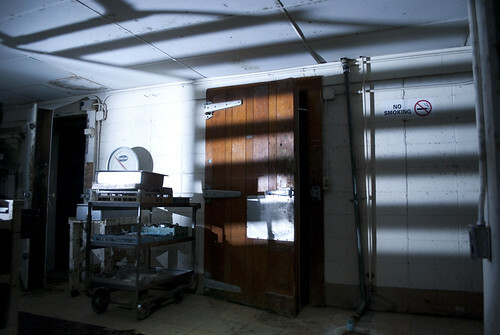 Photo: One of the undisturbed rooms. It is good to see that vandals or copper thieves have not made their way through the building. Photo by bitter_buffalo33. Photo: Despite the extreme cold the pool area remains quite humid. 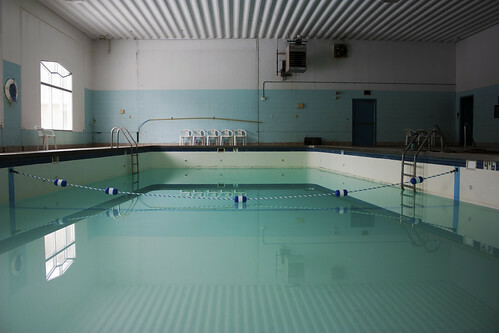 Photo: The whirlpool was completely empty. 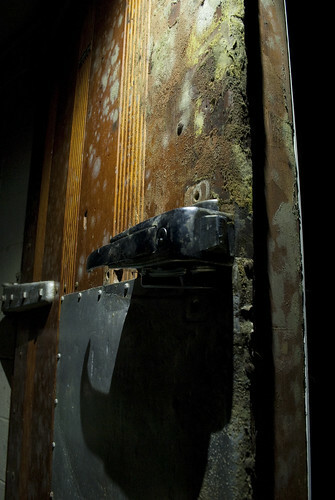 Photo: The basement refrigeration doors were made of wood. Photo by Nick Forslund. Photo: The damp basement provides the perfect environment for mold to thrive. Photo by Nick Forslund. Amazing urbex! I was astonished with the lack of vandalism in that hotel… it looks like it was foreclosed yesterday! Thanks for sharing yet another great set of images! You’ve got a 50-50 chance of guessing the right hemisphere where it is located, but this is one I’m not going to divulge. Thanks for keeping this one quiet Ken. Hey Ken! This looks fantastic! Im HUGE on Urbex, I got round three of Brachs and some other factories coming up this weekend, and I was wondering where this was! I live in Antioch, so wisconsin is just down the road, I would love if you could send me an address via email! Thanks! Your enthusiasm is great Zakary, but I’m afraid I cannot accomodate your request. 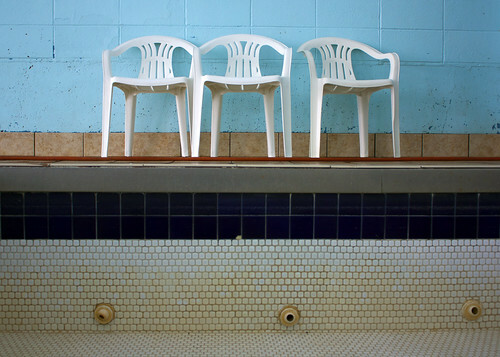 My girlfriend and I have stayed at this place, specifically because it was a terrible cold winter and she wanted to go swimming in their indoor pool when we stayed there, we were sure that there were only two other guests in the entire building, so it’s sad but not a huge surprise that the place went out of business. We loved it, but it also felt like an abandoned building while it was still in business. Just down the hall from the front desk were two already-abandoned dining rooms and a bar, completely dark and locked behind folding gates. And there was a tiny arcade, with games from the early 90’s like Lethal Enforcer. 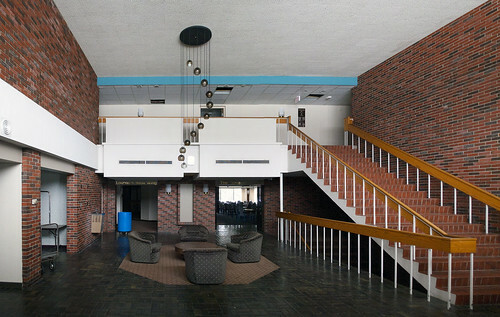 We took a lot of pictures while there, of the spooky pool and that wacky series of hanging light globes in the atrium. I had no idea this was no empty. Too bad. They’ll probably let it rot and then raze it. I hate watching things get wasted, but they just did that to a local restaurant in Shorewood, WI, which lay unused until they torn it down. I was very young when we were coming up to visit family in Wisconsin and I’m almost certain that this was where we stayed. There were so many great memories here with my family, even though it was very dingy lol. Do you remember what this place was called? Wow, I moved to Milwaukee last year and I actually work at a hotel similar to this. Crazy to think what just a little time will do to a place. I know this hotel. Used to do pest control at it. Lobby was a dead give away as to the basement photos. Was a nice place with nice people. Unfortunately I think when they built the new 6 lane highway to replace the 2 lane one that made the old 2 lane one the hotel was on a dead end hurt its business. Hi! I’m a photography student and would love to do my project at this location if you would be so kind to share, if you wanted to keep it private you could also email it to me. I would seriously appreciate it soooo much! Could you tell me where this is? Id love to take some pictures!